It has the highest toughness and strength at room temperature of all the advanced ceramic materials. It’s high thermal expansion (a=11 x 10-6/K) makes it similar to some types of steel. It also has excellent thermal insulation and low thermal conductivity: 2.5 to 3 W/mK. Zirconia ceramics have fine grain size, which allows for sharp edges and smooth surfaces. It also has the ability to conduct oxygen ions, and this can be used for the measuring of oxygen partial pressures in lambda probes. 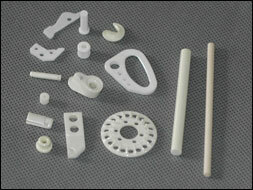 These properties make zirconia ceramics ideal for joining ceramic and steel, and other applications such as knives, pump shafts, metal-forming tools, tweezers, fixtures, scissors, auxiliaries in welding processes, tools for wire forming, materials for crowns and bridges in dentistry, and insulating rings in thermal processes. Some common zirconia ceramics products include zirconia plate, zirconia rod, zirconia tube, and zirconia ball. Zirconia ball valves, for instance, can be an ideal substitute for monal and titanium valves, as they offer low cost and longer working life. 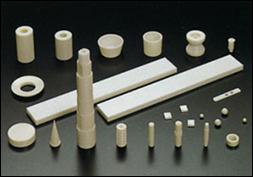 Zirconia Ceramics Zirconia ceramics are ceramic materials made from zirconium oxide (ZrO2); a material which exhibits high chemical inertness and very high thermal expansion as well as a very high resistance to wear and to crack propagation.